Less oil, even when Kettle Cooking, is bound to affect the crunchiness of a Chip. However, although these were not quite as hard and firm as some, there was sufficient crunchiness to accept it along with the benefit of less fat content. The Chips were not very Kettle Cooked looking. There were a number of curly, folded Chips, but the texture was fairly flat; a bit like regular Chips. A big disappointment was the lack of visible seasoning. It is always nice to see powdery substance to a flavored Chip, but these just didn't have quite enough on show. These were salty, sweet and Jalapeno flavored. However, that salty, sweet, Jalapeno flavor had the volume turned down just a bit too much. There was some after-burn, but only slight. 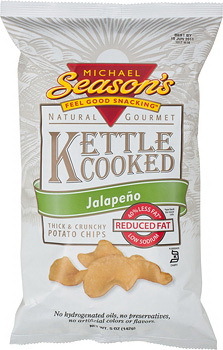 If you like a Jalapeno flavor, but not the accompanying heat, this is the Chip for you.